I was sitting in a hospital room at Jennie Stuart Medical Center in Hopkinsville, Kentucky scared out of my mind watching the second of three drugs go into my body. I had arrived at the hospital at 8 am and was brought to my room shortly after that, but it took forever before I was starting chemo. I was a nervous wreck; Was I going to feel the medicine being administered? How soon after was I going to be sick? Does it hurt? All of these questions were running through my brain as I waited for the nursing staff to get started. It also didn't help that it was my first time ever spending the night in a hospital. I didn't know what to expect. The funny thing about that though is that I was afraid that the food would be terrible and I wouldn't be able to eat all week. But, the food issue resolved itself around lunch time when the nurse said I could have food brought in. But, most of that was me just trying to think of anything to keep my mind off of what was about to happen... 12 weeks of chemotherapy. Looking back at it now, that cycle of chemo over the summer was gravy compared to the last cycle I went through. But, I didn't know that then. I was just bracing for the worst. So, finally, around 2 pm the nurse came in to access my port. Now let me remind you that my port had never been accessed prior to then, so I had no idea what to expect. WOW! That was excruciating! The area around my port was still tender and she gripped around the port to make sure the IV was inserted dead center and she bore down and jammed the needle in. Not gonna lie, almost cried. 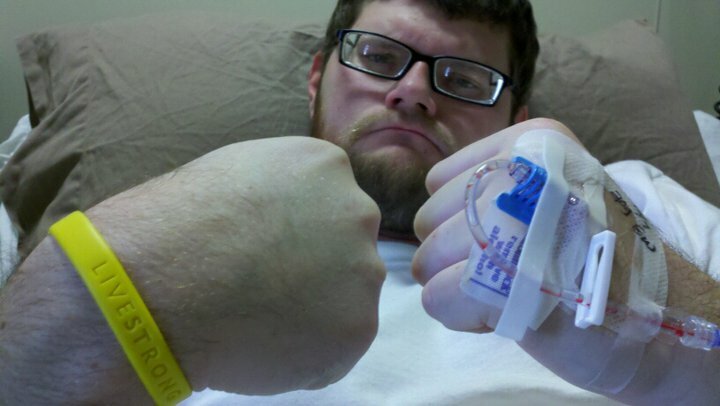 But following that they were able to start fluids as well as give me a little pain medicine to ease the nerves. After about an hour, they were able to start the first of the three medicines; etoposide. I remember sitting there as they got it ready to go and watching medicine drip down until it reached my port and thinking, "here we go" as it entered my body. I felt no effects immediately and all of the sudden I felt relieved about the whole situation. The etoposide lasted an hour and then it was the cisplatin. That was the one the doctors said would possibly make me ill. They got it hooked up and 3 hours later, it was done as well. The last of the night was the bleomycin. When they brought it in I said, "is that it?". It was just a syringe with what I thought looked like around 120 cc of fluid. Not anything like the other two. But upon further investigation I found out that the Bleo was the most potent of them all. The nurse started the push and a out ten minutes later I was done for the night. I was starving by the time I finished so I asked for a dinner plate. They brought it in and it was some kind of salsbury steak, rice, and carrots. I scarfed it down and sure enough about 30 minutes later, I got sicker than I had ever been in my life (at least I thought so). But the nurses got in and were able to get the nausea under control and allow me to rest comfortably. It's weird thinking that it's been a year since I started chemo. With all the event that had happened within the year it definitely seems like longer. But, I just felt like reminiscing and felt it would be appropriate to share it with you all as well. I'm definitely beginning to feel more and more like myself. I went out last Friday and played my first round of golf since the surgery. Didn't play all that well, but it sure was fun to get out with my friends and have a normal day. I've been able to get back out and start mowing my own lawn again, which is great as well. I've greatly appreciated everyone who has chipped in to help out, but there is something about being able to mow my lawn myself that is just satisfying. Well, I won't bore you anymore tonight. Have a great evening and God bless.